Given we still have a lot of leftover kimchi from our kimchi making experiment last week, my boyfriend decided to make kimchi noodle soup. 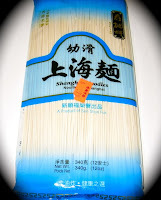 His recipe calls for super soft Shanghai noodles that you can easily find at any market in Chinatown. At 79 cents a batch - this recipe is a perfect cheap eat. Boil the noodles just like you would any kind of spaghetti. 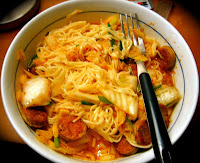 Add some sausage if you want to go carnivore - drop in some kimchi and you have yourself a nice bowl of kimchi noodles. The kimchi really gives it a nice spicy and refreshing twist - on a hot day drain the noodles and refrigerate for a cold noodle dish.